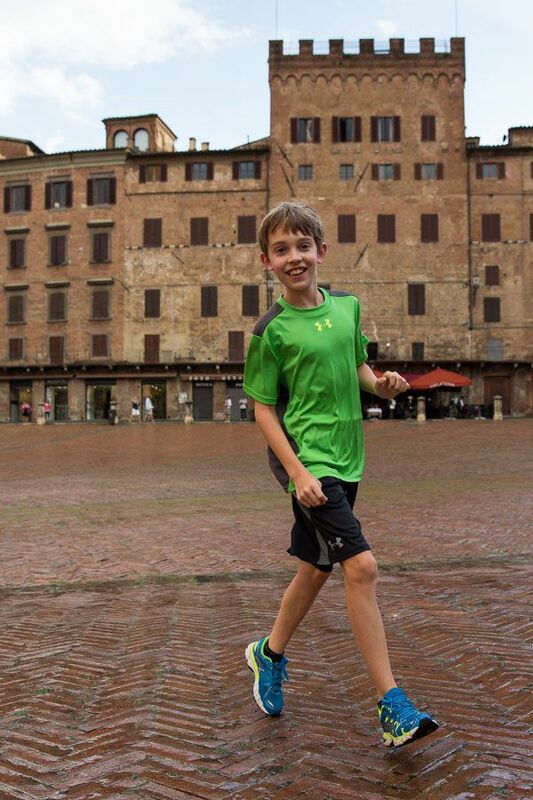 We spent five days in Tuscany, staying in the town of Siena. 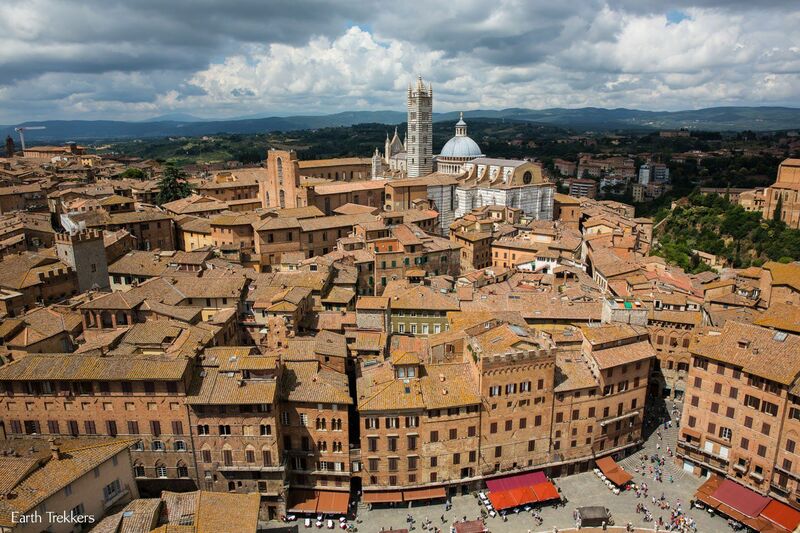 We picked Siena as our home base because it is well connected by bus to the other hill towns in Tuscany and easy to get to from Florence. It was a good pick because we loved it here. 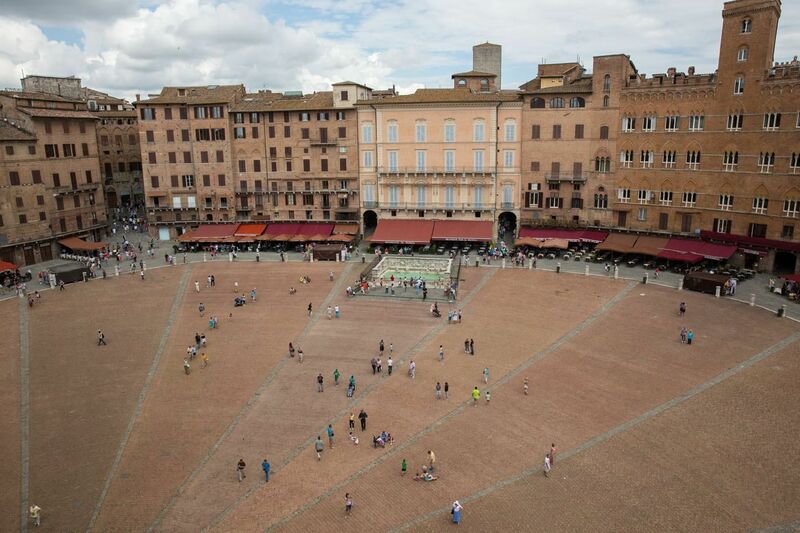 We stayed in an apartment in the heart of Siena, so seeing the main piazza, Il Campo, or getting to the train and bus stations, were just a short walk away. Siena is considered a hill town in Tuscany, although it really feels like a small city. 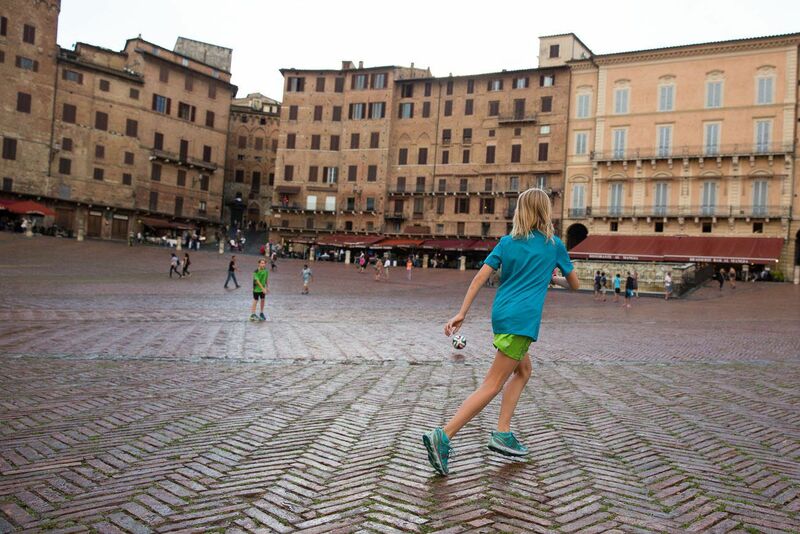 We loved walking through the narrow cobblestoned streets, which we did most nights to go to Il Campo. 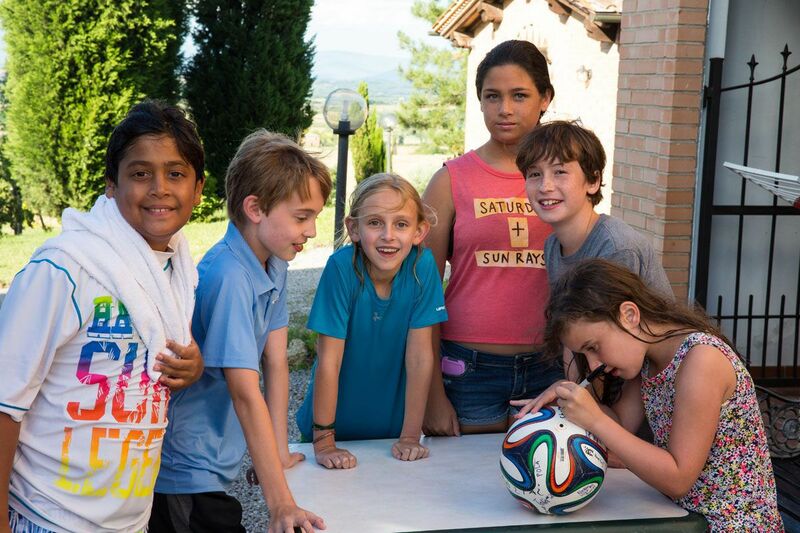 Tyler and Kara liked bringing their soccer ball to see if there were any kids interested in playing pick up soccer. They got lucky one night, playing with a family from Poland. It was much less crowded here than in Florence, so it was a nice break from the hoards of tourists in Italy in July. We had great weather, with temperatures in the very low 80’s during the day. Almost every day, around 3 pm, no matter where we were in Tuscany, there would be a thunderstorm that would pass by. It happened so regularly that you could almost set your watch by it. Once the storm passed, the skies would be clear again and we were rain free until the next afternoon. 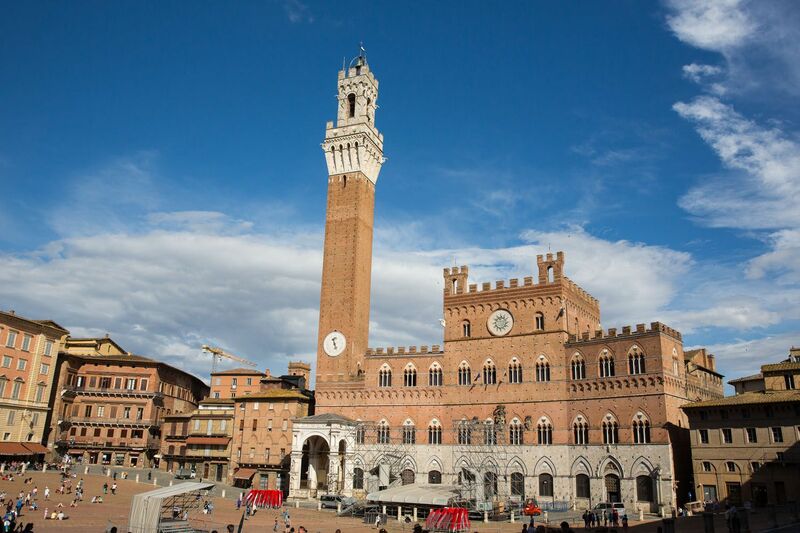 One afternoon we climbed the tower overlooking Il Campo and Siena. 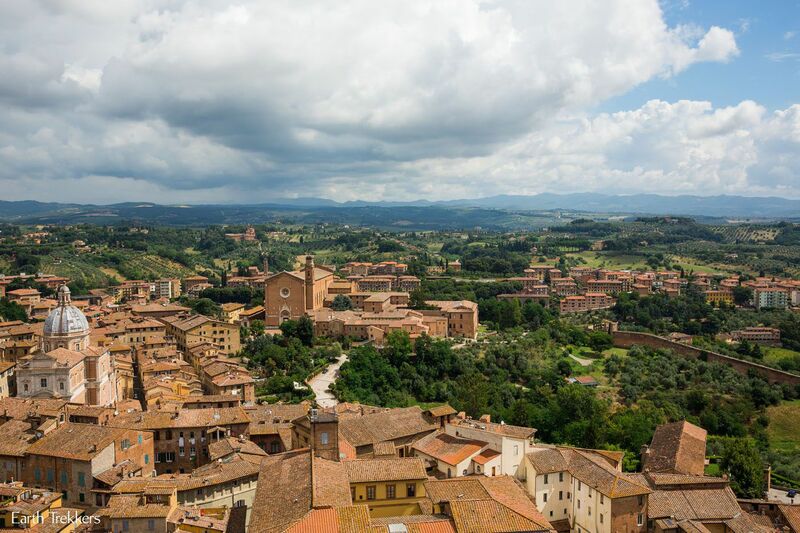 The views of Siena and the surrounding countryside are amazing. 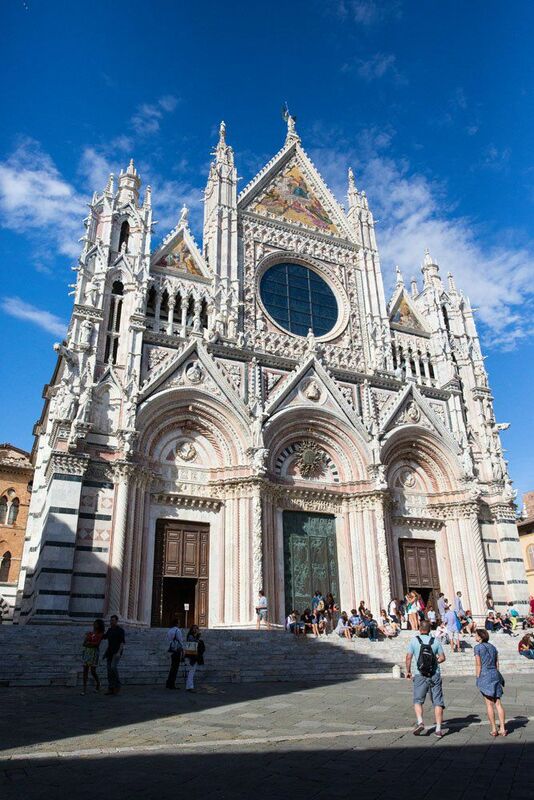 We also visited the Duomo in Siena. This place looked wild on the inside. Tyler and Kara called it the zebra church. We spent one afternoon visiting Arnie and Linda, friends of mine from Maryland, at the Tuscan villa they were renting. 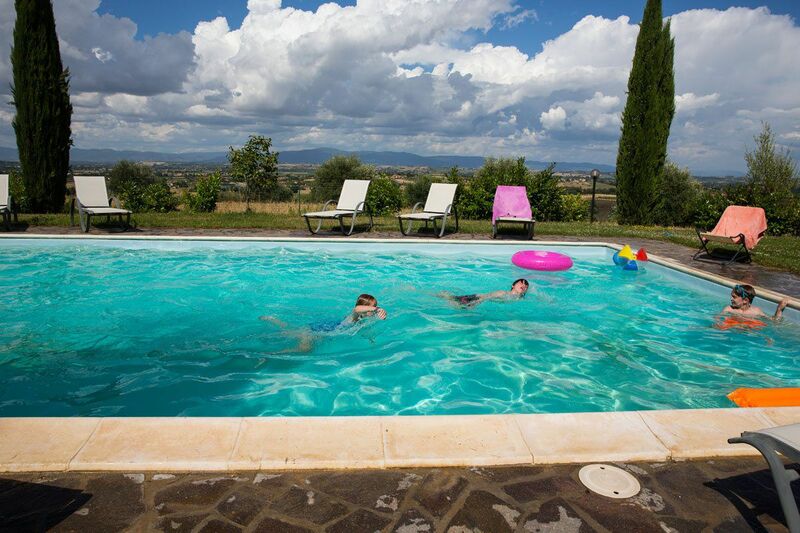 Tyler and Kara were thrilled to go swimming in their pool, and Tim and I loved talking with other adults and enjoying some great Tuscan wine. 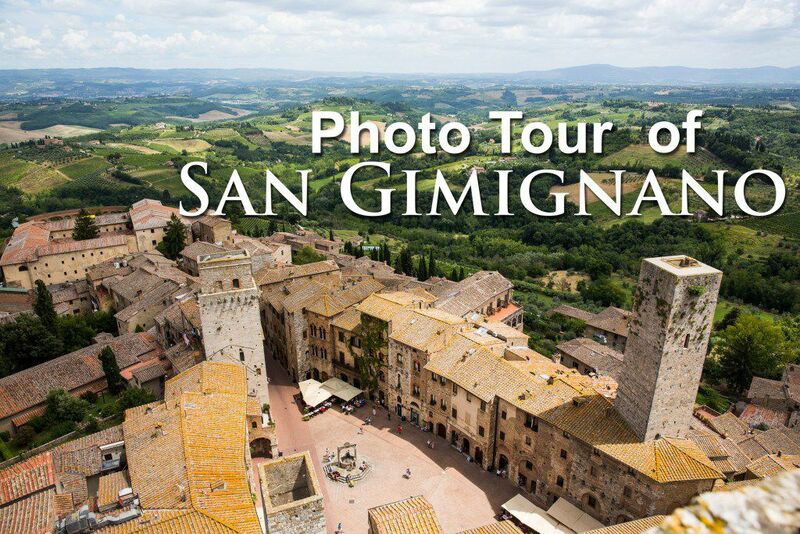 We spent a day touring the hill town of San Gimignano. 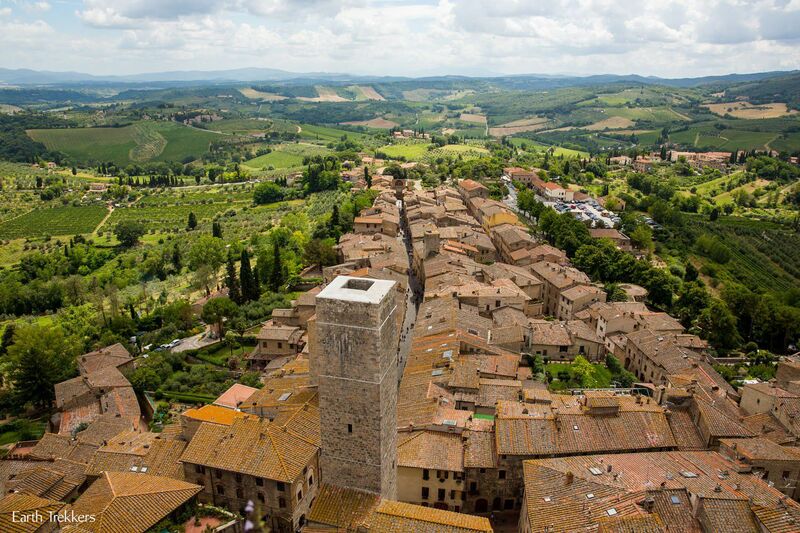 San Gimignano is one of the most popular hill towns to visit in Tuscany, partly because it is so easily connected to Florence and Siena with the public bus system. 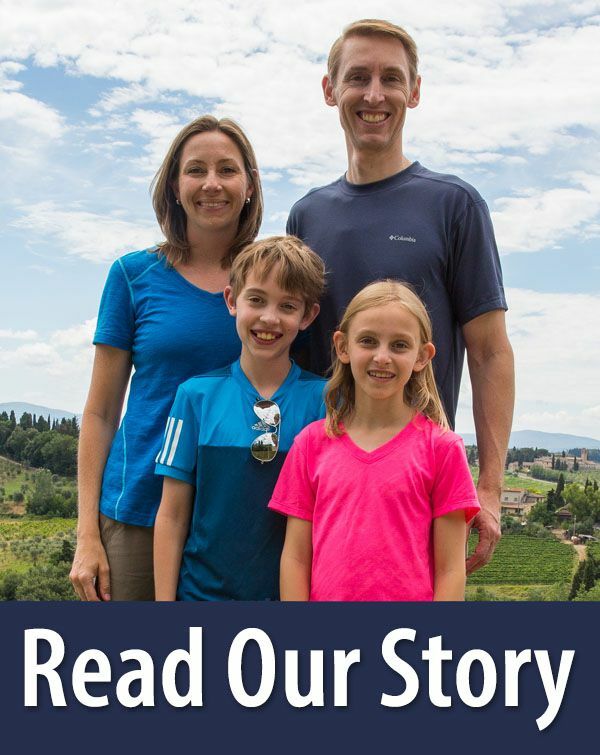 During our final day in Tuscany, we spent a little more money, renting a car for the day. It was wonderful to have the freedom of a car, to go where we wanted to, no longer at the mercy of the unreliable SITA buses. Unfortunately, we learned that Kara gets carsick, throwing up in the parking lot just outside of Montalcino. 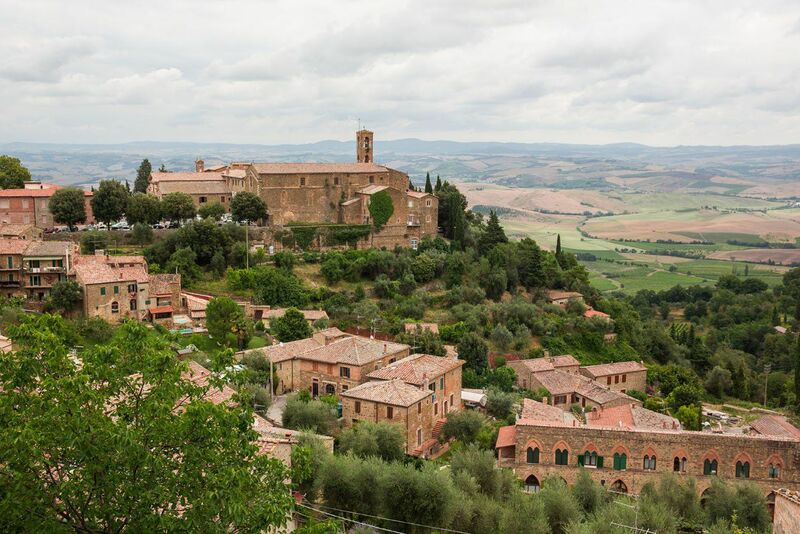 Montalcino is a small hill town. 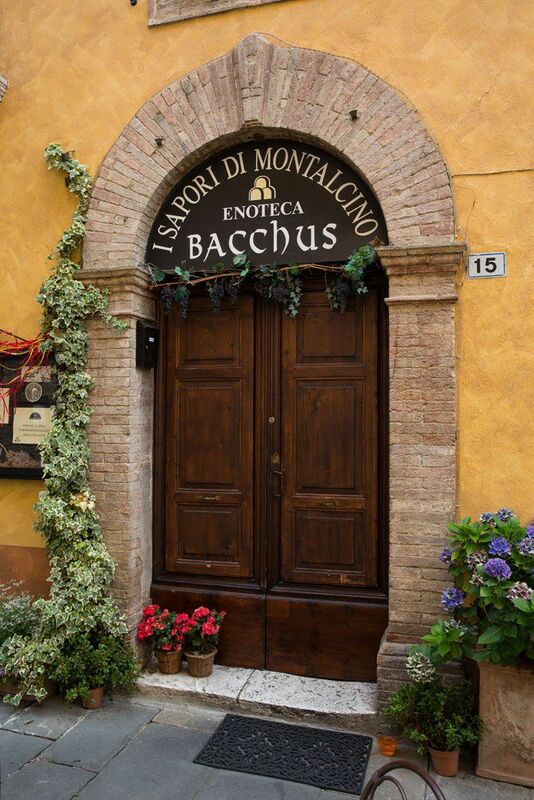 This town is packed with shops trying to lure people in to buy their Brunello di Montalcino wine. It was still too early for lunch (restaurants did not open until noon) but shops were open for wine tastings. 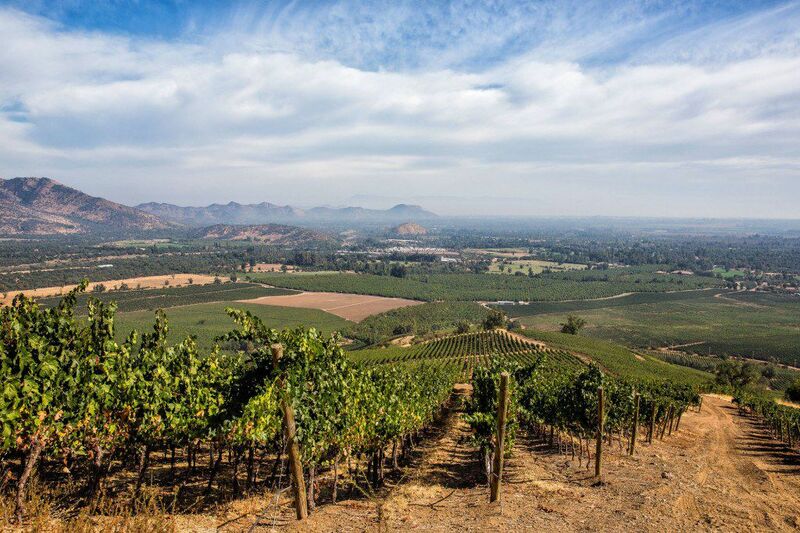 My favorite part of the day was tasting various wines from the region. We bought one bottle of Montalcino wine to drink once we got to Germany. A half an hour drive later, and with no tummy troubles from Kara, we made it to the beautiful town of Pienza. This town, which is very small, is a medieval town with all of the buildings built from stone. 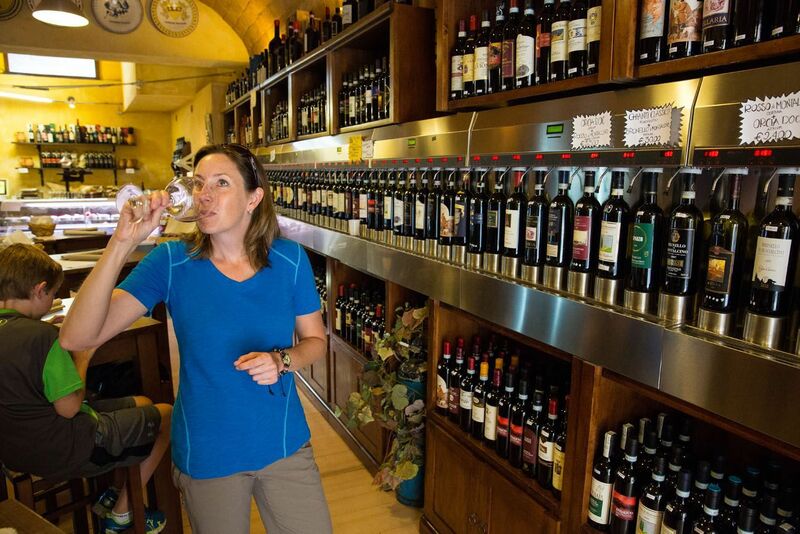 We walked the pedestrian streets, enjoyed the magnificient views over Tuscany, and did a little window shopping. We visited on a Monday, apparently the day of the week this little town closes up shop, so all restaurants were closed for the day. 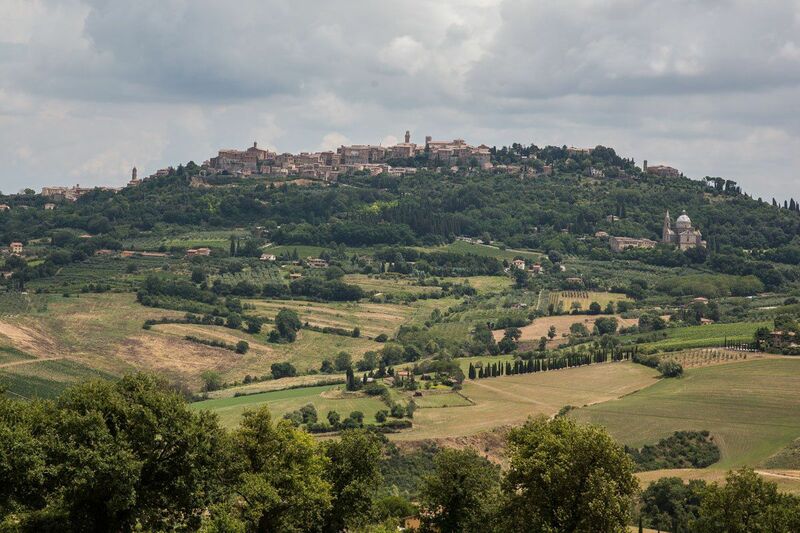 We ended our Tuscan tour at Montepulciano. This town was the biggest of the three we visited today. It sits high on a hilltop, overlooking some of the best scenery of Tuscany. Storm clouds were rolling in and it was getting close to 3 pm, so we only had a little time before rain would be falling. By now we were starving, so we ate lunch at a great little restaurant, with views out of town and over the countryside. 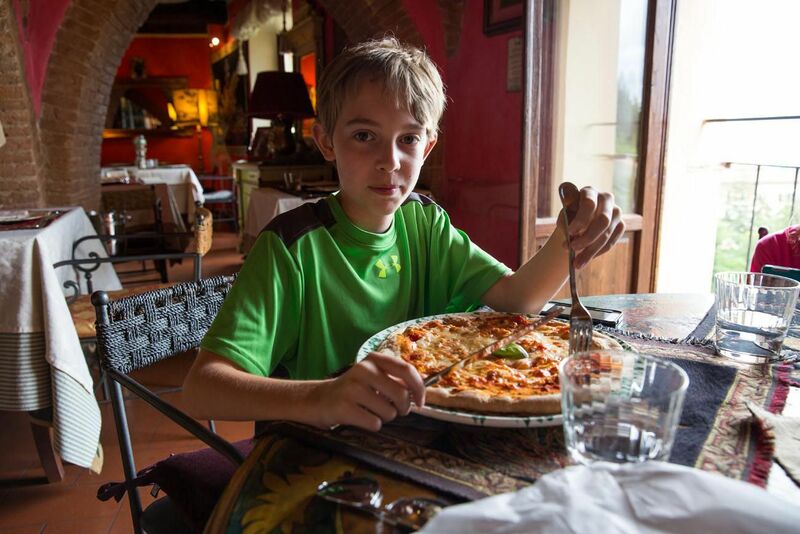 We ate pizza and pasta for lunch, Tim and I had a little wine, and I will never get tired of the food in Italy. Just as we were about to leave the restaurant, the skies opened up. Instantly the temperature dropped twenty degrees and we were stuck in a downpour. 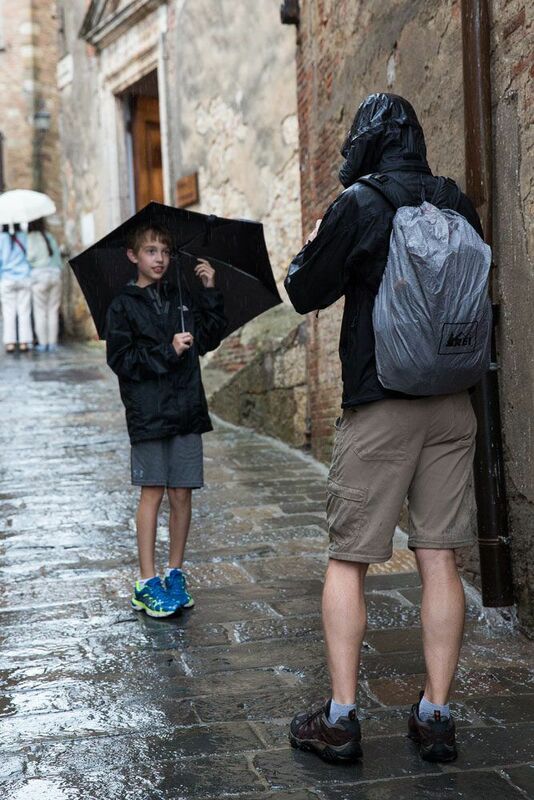 Determined not to let rain ruin our fun, we walked through Montepulciano in a torrential downpour. We took shelter once the thunder and lightning really got going, and waited out the passing storm. These afternoon rainstorms are crazy!! This ended our day touring Tuscany by rental car. 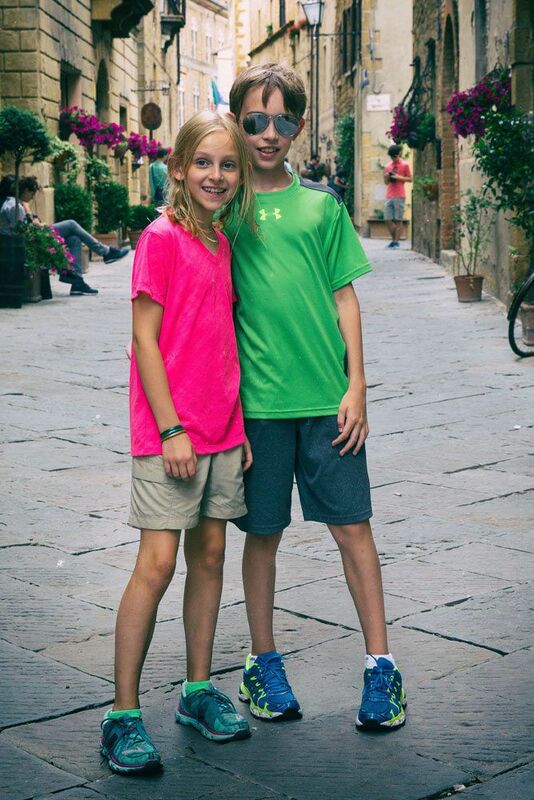 The other days we had left in Siena we spent on homeschooling, much to the delight of Tyler and Kara. Tuscany is amazing. 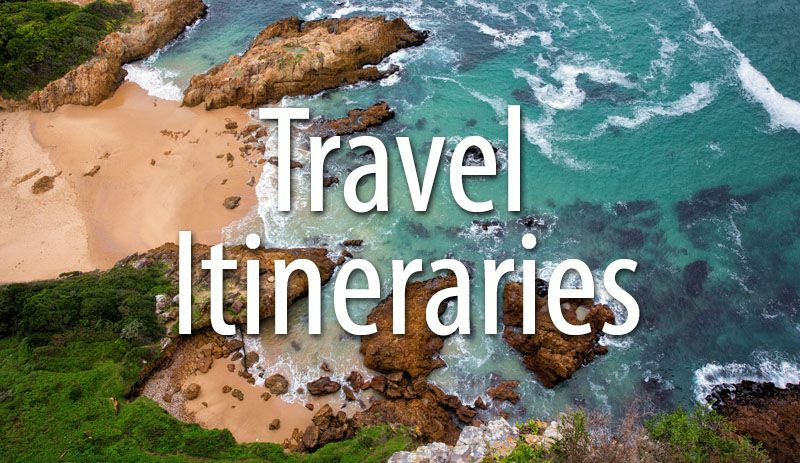 It’s worth at least a few days on any itinerary to Italy. The hill towns are all linked by the SITA bus system, but in order to see Tuscany this way you have to have a lot of patience. On more than one occasion, the buses would show up 45 minutes late, or fail to show up at all. It was incredibly frustrating. I would recommend either renting a car or hiring a driver. 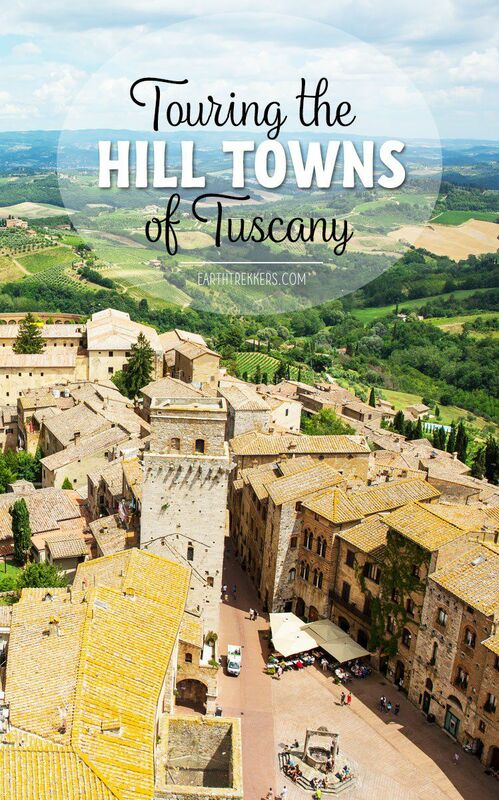 There are many other hill towns to visit and you would need at least a week in Tuscany to try to see all of them. 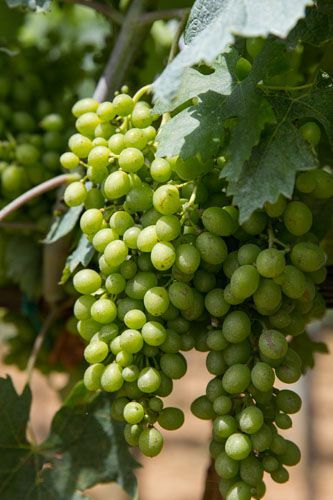 Honestly, by the time we reached Montepulciano, they were all beginning to look the same. My favorite part of Tuscany was driving through the countryside, past fields of sunflowers, vineyards, and farmland. 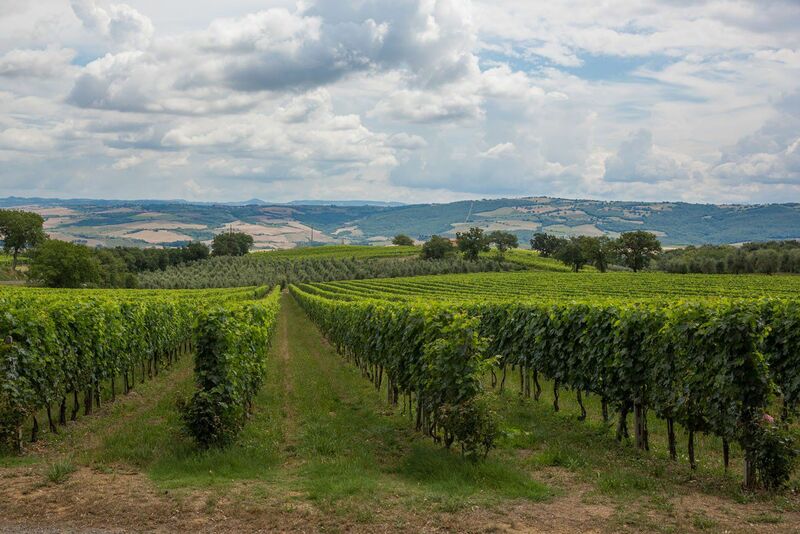 Tuscany is beautiful, the wine is delicious, and this is a place we would like to return to again someday. First of all, your blog is so helpful and interesting! Second, I think you mentioned renting a car one day in Siena. Did you book in advance? Also, were you able to rent an automatic car? 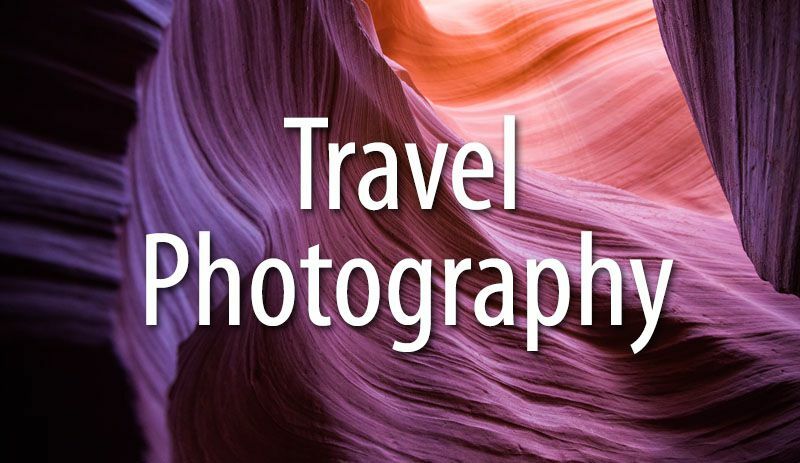 Your pictures look amazing! I have never considered Siena as a base to explore Tuscany, so thank you for the tip. 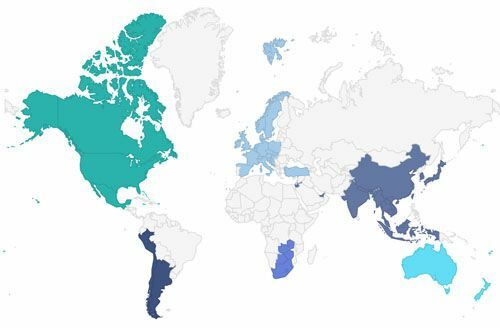 When do you think is the best time to visit it? 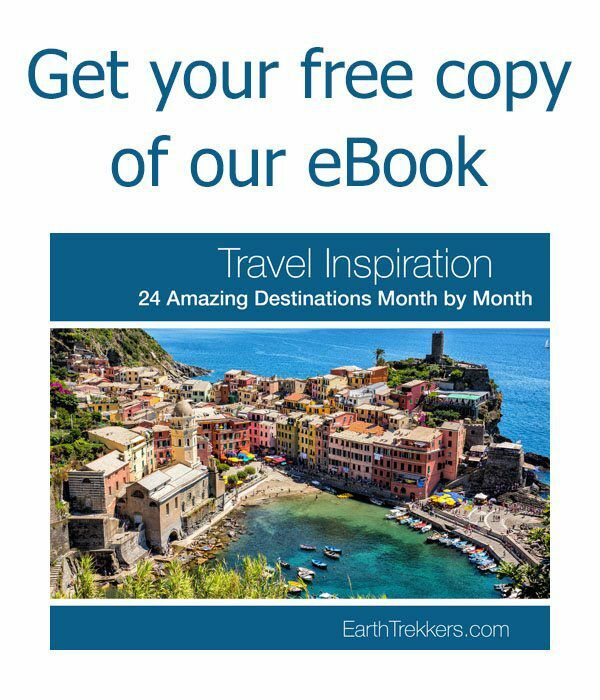 I have spent 1 1/2 years in Europe, most of it in Italy. 30 years later I am about to spend 2 weeks there with the love of my life that enjoys adventure and hiking like I have never known. I stumbled across your pages. 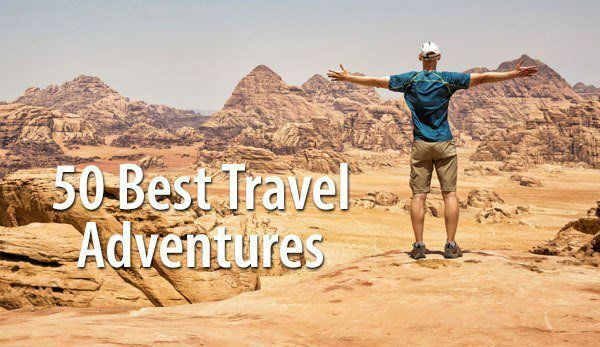 We plan to do soo many places that your family has done and it is sooo inspiring to me to read all of your incredible reviews. 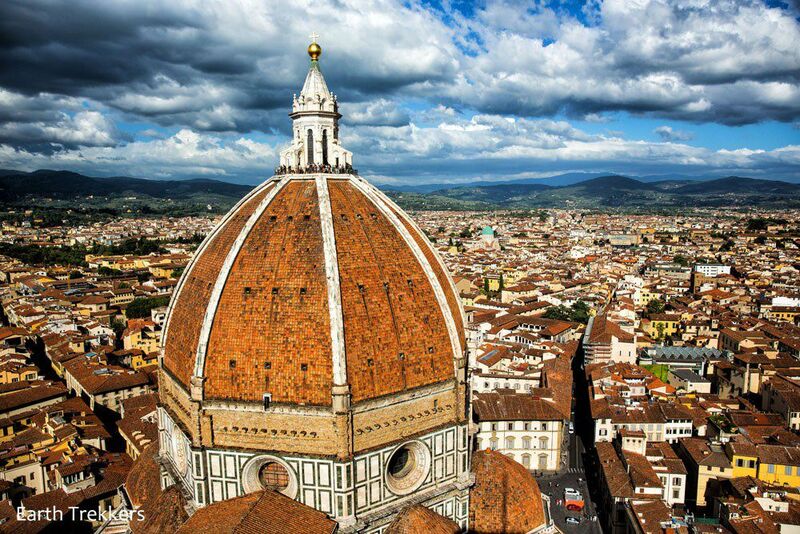 Your detail is wonderful and reassures me that from Rome to Capri to Sienna and finishing in Cinque Terre will not disappoint. I know neither of you at all but after reading and seeing soooooooooooo many of your families photos I feel emotionally connected. The smiles on your children’s faces tell amazing stories. Thank You for all of your passion in your postings and God Bless. Erik & Kim, Seattle WA. 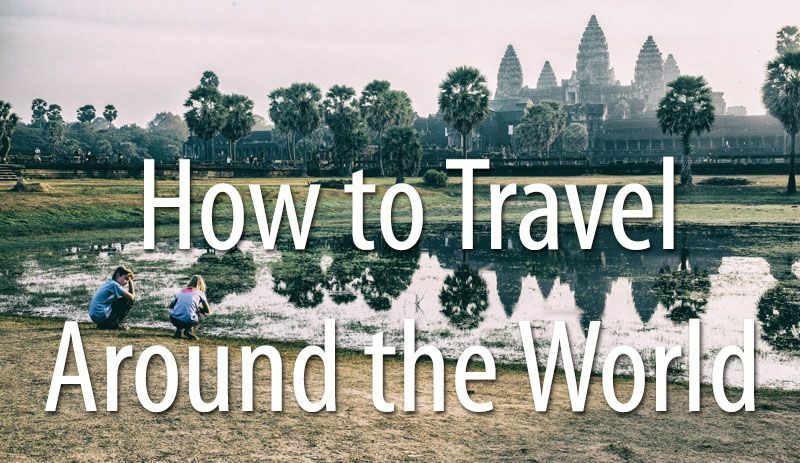 I am loving the pictures and keeping up with your travels! Thank you for sharing this amazing experience! 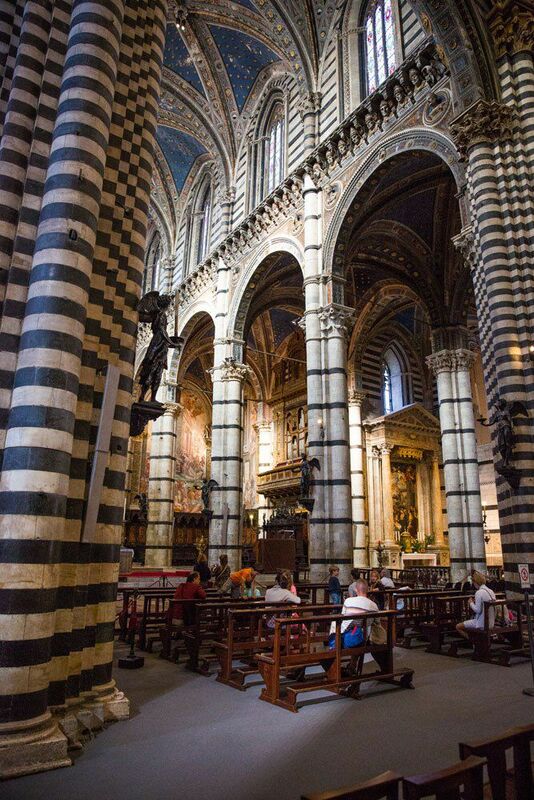 My wife and I, a few years ago, rented an apartment in Siena right off the Campo. It was just behind the University of Seina. 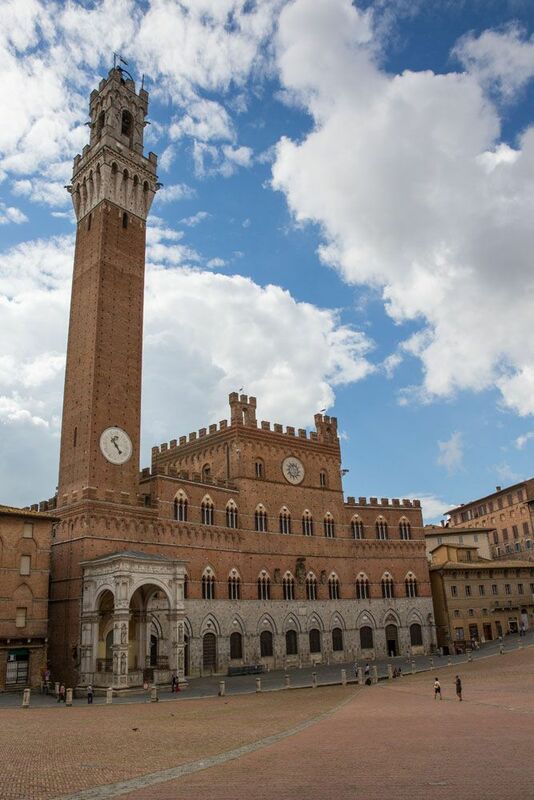 We had visited Siena a few times before and had rented a small villa outside of town before then. We had a car and used it to go to many of the same towns you visited. One of the best travel times we had every had. Hope to go back some day. Your blog with the pictures brought many wonderful memories. Viaggiare in sicurezza! Looks like a a great time for all of you. Just be safe , the world is a crazy place right now… I am loving your pictures! !